If Practice One was uneventful, Practice Two made up for it. At least three cars found the gravel traps, one with slight damage. Simon Pagenaud and Zach Veach both brought out the red flags for venturing off course. Then late in the practice, Juncos driver Rene Bender went off track and made contact with the tire barrier. Was it the hotter temperatures this afternoon? I’m not sure. Two drivers eclipsed Will Power’s top speed from this morning. Josef Newgarden and Spencer Pigot were both quicker than Will Power, with Newgarden’s best lap of 1:07.4345 being today’s quickest time. While this morning’s temps were in the low sixties, it was in the seventies this afternoon, but felt warmer than that in the brilliant sunshine. Just before he went off track, I got a good video of Simon Pagenaud leaving his pit, and this time I managed to get it at regular speed. As he disappears over the ridge, you get a sense of the elevation changes at this place. 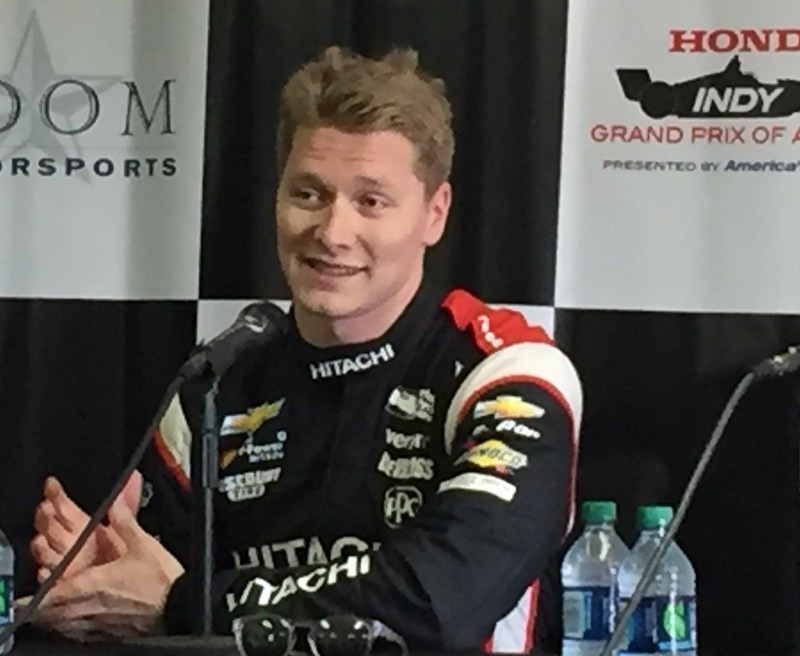 After practice, Josef Newgarden came into the press conference. He was asked why he performs well at this track and he said he really didn’t know, but he was glad since this is the closest track to his hometown of Nashville. Later, he was asked about the impending rain on Sunday. he said it would be a learning experience since no one has raced this new car in the rain. With the significant reduction in downforce, he promised it was going to be slick if it rained. All indications are, there is little doubt that it will rain heavily on Sunday. That’s going to do it for me today. Susan is on her way, but will probably not get to the track until after 6:00…just in time to leave. But we will be here early tomorrow. Practice Three starts at 10:50 CDT tomorrow morning. Again, I’ll be posting throughout the day so check back early and often. In the meantime, you can follow me on Twitter at @Oilpressureblog and Susan at @MrsOilpressure. See you tomorrow. This entry was posted on April 20, 2018 at 5:06 pm and is filed under IndyCar. You can follow any responses to this entry through the RSS 2.0 feed. You can leave a response, or trackback from your own site. Another good one from the skinkster. Billy gets no respect.